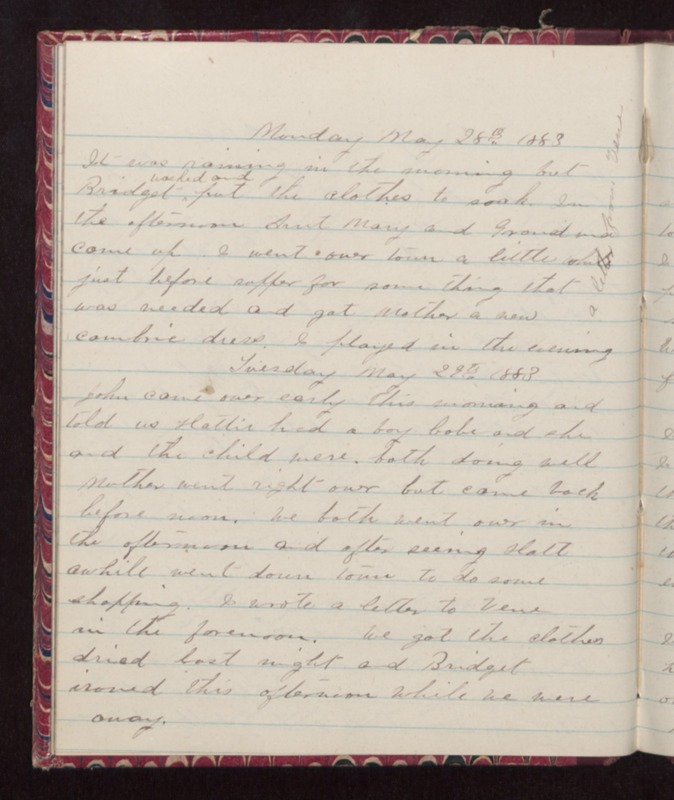 Monday May 28th 1883 It was raining in the morning but Bridget washed and put the clothes to soak. In the afternoon Aunt Mary and Grandma came up. I went over town a little and just before supper for some thing that was needed and got Mother a new cambric dress. I played in the evening. A letter from Vene. Tuesday May 29th 1883 John came over early this morning and told us Hattie had a boy babe and she and the child were both doing well. Mother went right over but came back before noon. We both went over in the afternoon and after seeing Hatt awhile went down town to do some shopping. I wrote a letter to Vene in the forenoon. We got the clothes dried last night and Bridget ironed this afternoon while we were away.